After the game, Wentz's left knee was wrapped in a brace. He was driven in a cart up the tunnel at the Los Angeles Memorial Coliseum and then hobbled to one of the team buses. Philadelphia Eagles quarterback Carson Wentz is escorted off the field after injuring his knee in the second half of the Eagles' 43-35 NFL win over the Los Angeles Rams at Los Angeles Memorial Coliseum on December 10, 2017. Carson Wentz threw a touchdown pass a few plays after suffering an injury that could ruin a special season for the Philadelphia Eagles, and then stuck around to greet teammates and celebrate a division-clinching victory with them. It's always team-first for No. 11. 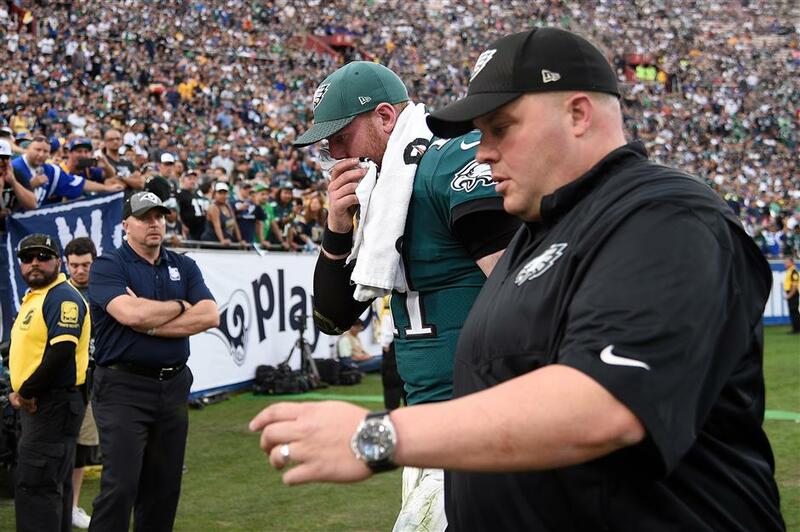 Two sources familiar with the injury said that doctors believe Wentz tore his left anterior cruciate ligament in a 43-35 comeback win over the Rams on Sunday and will miss the rest of the season and playoffs. Wentz, a favorite in the NFL MVP race, will have an MRI on Monday to confirm the severity of the injury. Both people spoke on condition of anonymity because they weren't authorized to release the information. "I don't know anything until we evaluate him (on Monday)," Eagles coach Doug Pederson said. Wentz wrote on Twitter: "NFC East Champs! So proud of the resiliency of this team. Such a special group of men. And I greatly appreciate all the prayers! I know my God is a powerful one with a perfect plan. Time to just lean in to him and trust whatever the circumstances! #Proverbs3:5-6"
Wentz was hurt late in the third quarter at Los Angeles. Backup Nick Foles rallied the Eagles (11-2) to a win that secured the NFC East title and put them in first place in the conference with three games remaining. "Everyone is really excited about the win but you have your starting quarterback go down, it's emotional," Foles said. "It's emotional for me. I work with him every day so I'm dealing with that." The Eagles have overcome several key injuries and now have to move forward without their most indispensable player. Nine-time Pro Bowl left tackle Jason Peters, return specialist/running back Darren Sproles, star linebacker Jordan Hicks and special-teams captain Chris Maragos already went down for the season. But they're not the franchise quarterback. "It (stinks) more so for Carson as a person and a friend and a teammate and what he puts into the game and his preparation," safety Malcolm Jenkins said. "But as a team we have all our goals in front of us." Wentz is the latest NFL star to go down in a season in which several high-profile players have been sidelined. Seahawks cornerback Richard Sherman and safety Kam Chancellor, Texans defensive lineman JJ Watt and quarterback Deshaun Watson, Giants receivers Odell Beckham Jr and Brandon Marshall, Chiefs safety Eric Berry, Browns tackle Joe Thomas and Vikings running back Dalvin Cook and quarterback Sam Bradford each sustained season-ending injuries. After starting all 16 games as a rookie, Wentz made a giant leap this year. He passed for 3,296 yards, 33 TDs and only seven interceptions. Wentz again was spectacular against the Rams before he got hurt after getting hit hard as he scrambled into the end zone on a play that was called back because of holding. He stayed in the game and threw a 3-yard TD pass to Alshon Jeffery on fourth down four plays later, setting the franchise record for most TD passes in a season. "It shows how tough he is," Pederson said. Wentz arrived in Philadelphia as the No. 2 pick in the 2016 draft out of North Dakota State. On Sunday, he outperformed Rams quarterback Jared Goff, the No. 1 pick in that draft. Despite the injury, Wentz celebrated the victory over the Rams (9-4) with teammates. "He's one of the leaders on the team. He was there congratulating and celebrating with everyone," Foles said. Foles, a third-round pick by former Eagles coach Andy Reid in 2012, is in his second stint in Philadelphia. He replaced an injured Michael Vick in 2013 and led the Eagles to an NFC East title during Chip Kelly's first season as coach. Foles tied an NFL record with seven TD passes in a game at Oakland in November 2013 and finished that season with 27 TDs and only two picks. The Eagles lost at home to New Orleans in the playoffs. Foles went to the Pro Bowl and was the offensive MVP. But Kelly traded Foles to St Louis for Sam Bradford after the 2014 season. Foles spent a year with the Rams, a season with the Chiefs and returned to Philadelphia as a free agent this season. "I'm absolutely ready to go — need be," Foles said. "I prepare every day."